SnitchSeeker Reviews You'll find all the latest reviews here, covering all aspects of the Potter fandom. The Harry Potter coin collection are set in plastic covering for display purposes as well as protection of the coins themselves. The coins, which are authentic Great Britain half pennies from 1966 and 1967, have specialised paintings of various promotional images of characters from Harry Potter and the Order of the Phoenix and Half-Blood Prince. At first, the idea of Harry Potter characters painted onto coins, even half pennies, seemed a bit far-fetched and lacking genuineness, but having seen them in person, their craftsmanship is rather impressive. You'd only know that the painted coins were in fact actual half-pennies if you were looking at them from an inch away, and even at specific angles to catch the protruding serial numbers and profile. The coins, featuring painted versions of promotional images of such characters as Harry Potter, Ron Weasley, Hermione Granger, Draco Malfoy, Albus Dumbledore, Rubeus Hagrid, Lucius Malfoy, Bellatrix Lestrange, and Lord Voldemort, look just as clear as though they were painted on a flat sheet of paper or posterboard, or even a digital image online. The coat of paint is indiscernible, in that it is so thin that it's rather remarkable that something so concise was painted right onto a coin. The three coin sets are displayed in a cardboard set with the Harry Potter emblem on them, which are encased in plastic. The coin collections are great collectibles for die-hard Harry Potter fans, and a great set of merchandise for display, especially for those who are avid coin collectors. 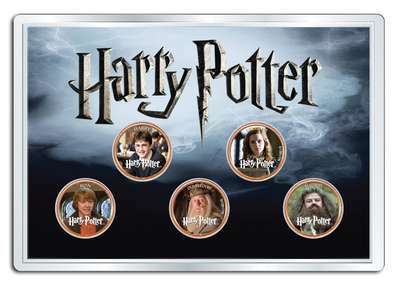 The Harry Potter 2010 coin collections, by International Numismatics, can be purchased here.